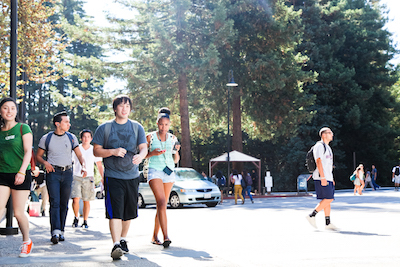 UC Santa Cruz attracted a record 45,534 applications from high school seniors and 8,799 applications from transfer students–also an all-time high–during the application cycle that closed Nov. 30, according to data released today by UC's Office of the President. "As the campus begins a year-long celebration of its 50th anniversary, it's fantastic to see interest in UC Santa Cruz reaching these levels," said Michael McCawley, director of admissions. "Students from California and around the world now know UC Santa Cruz will both prepare them for the next phase of their lives, while also offering opportunities for personal growth." "Ensuring we continue to attract and enroll students both locally and from around the world enriches the educational and cultural experience for all undergraduate students," McCawley said. "A UC Santa Cruz graduate will be well prepared to compete in today's global society, whether working for a tech company in Silicon Valley or sharing sustainable farming methods abroad. "Our faculty, alumni, students, and staff have all played an important role in achieving these successful application numbers," McCawley said. "Prospective students and their families often come into contact with members of our campus community and our alumni, and because of those interactions, they decide to apply." "We will be reducing our enrollment to better align with current funding to ensure we do not compromise quality," Galloway said. "As a result, UC Santa Cruz will be more selective than ever before." "We offer an outstanding undergraduate experience, top-flight programs for graduate students, and tremendous opportunities for scholars and researchers across the academic spectrum," Chancellor George Blumenthal said. This year the campus is celebrating its 50th anniversary with a series of events and lectures. UC Santa Cruz opened September 27, 1965 with 652 students and has grown to more than 16,000 undergraduate and post-graduate students. Then-UC President Clark Kerr noted Santa Cruz as "the most significant educational experiment in the history of the University of California." UC Santa Cruz ranks first in the world for the impact of its research as measured by the average number of times its faculty's published work is cited by scholars around the world, according to a survey published by Times Higher Education.